Over the past 5 years I have used two main battery types for backpack portable operations. 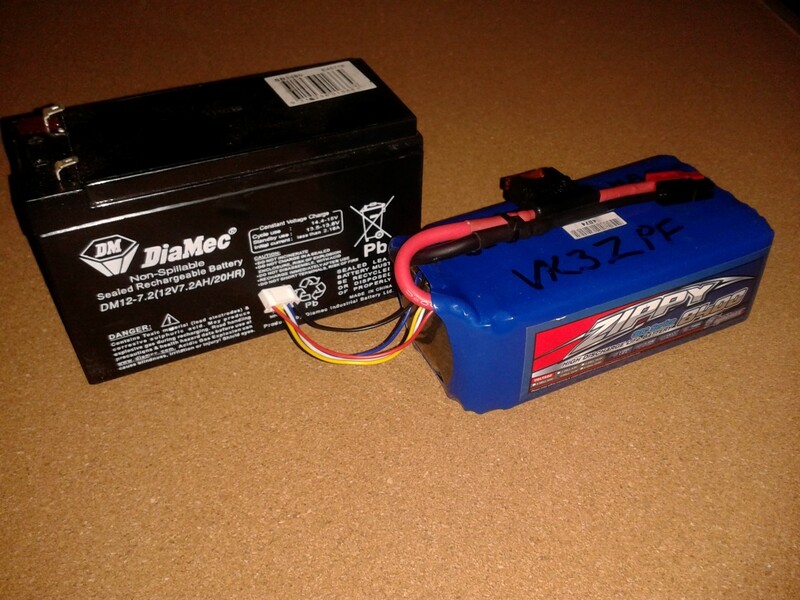 My first battery, weighing 2.06 kg, was a 12 V 7.2 Ah sealed lead acid battery. The more recent battery, weighing 1.05 kg is a 13.2 V 8.4 Ah Lithium Iron Phosphate battery. Prior to the 2102 French Island trip I load tested the SLA batteries I was taking to be sure of their performance. The newest of these batteries is shown in the chart below. Last weekend I performed the same load test on the LiFePO4 battery, also shown in the chart below. The load used was a 50 Watt quartz halogen light bulb, the battery voltage was sampled every 5 minutes and the test stopped when the battery reached its suggested minimum discharge voltage. Each battery was fully charged, on a suitable charger, at the start of the test. The temperature during each test was about 18 degrees C.
From these test you can see why I prefer the LiFePO4 battery. Longer time, lower weight, smaller size. Unfortunately it comes at a much higher cost. Do these curves agree with your real-life experiences with the batteries? I ask because the halogen bulb’s power consumption will go way up when overvolted to 14.5 volts like it was at the beginning of the SLA test. That being said, I guess one should expect the LiFePO4 battery to come out on top based on the chemistry’s superior high-discharge performance and the 1.4 AHr advantage. How much operating time do you get out of them? Say with cw @ 100w. Running the FT817 at 5 Watts I get many activations. I can’t say exactly how long the LiFePO4 lasts as I have never run it to the end on the FT817. What charger do you use with your 8.4 amp hour LIFePO4 battery? It needs to be programmed with the final capacity (8.4). I need to update my charger. Hi Peter, it’s good to see some real stats like that. Do you have a preferred source of the Lithium batteries? I get my LiFePo4 batteries and chargers from the Australian warehouse of Hobbyking.